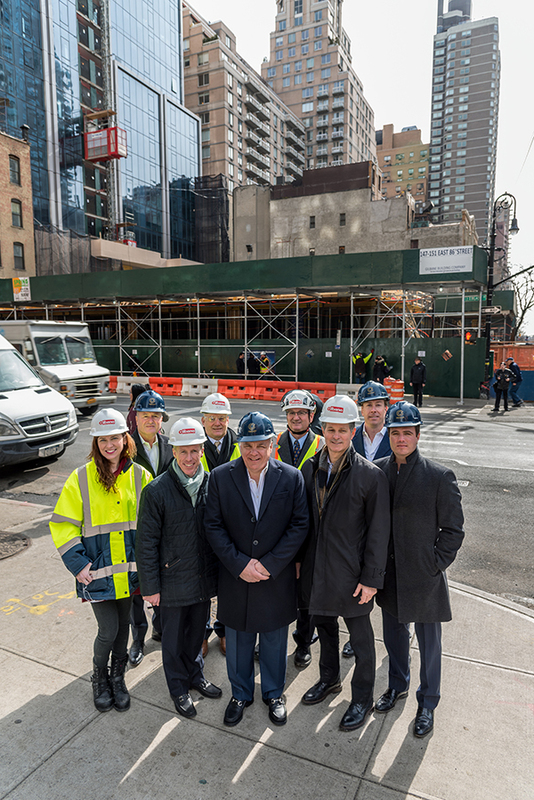 Manhattan, NY According to Ceruzzi Holdings LLC, construction is underway at 147-151 East 86th St., its 18-story, 210-ft. mixed-use development in partnership with Kuafu Properties. Construction financing has been provided by TCI Fund Management Ltd. and arranged by Holliday Fenoglio Fowler, L.P. (HFF). The project, which will offer 61 condominium homes, totals 230,000 s/f – 25,000 of which will be dedicated to retail space on the ground, second and lower level of the building. Sales are expected to commence in the coming months and the majority of the retail space has already been leased to Old Navy, who signed a 15-year term for 18,500 s/f on the ground and second floors. The construction process began with the demolition of the 147-151 East 86th St. properties, and an excavation program which included line drilling, rock excavation and adjacent property foundation reinforcement and underpinning. One of the first major steps in this process was to build the new temporary MTA sidewalk entrance in front of 147 East 86th St., which included demolition of the existing structure in the basement of the old buildings and construction of the new staircase entrance from station to street level. Once completed, there will also be a new ADA elevator from the sidewalk to the station below. The foundation system required coordination with the MTA through the numerous logistical phases. The construction team, led by Gilbane, performed abatement, demolition and excavation activities with minimal street and sidewalk space for material, equipment and loading out. The team overcame this challenge and accelerated the demolition and excavation phase. The building’s superstructure is steel reinforced concrete. The homes boast Italian Calcutta marble in the kitchens, bathrooms and powder rooms and Greek Thassos marble in the master bathrooms with book matched powder room stone from Carrara, Italy. Ceruzzi and Kuafu worked in conjunction with executive architect, HOK Design and interior designer for the project, Shelton Mindel Associates for the beautifully detailed interiors.